Editor's note: 2018 was an incredible year for UTSA students, faculty, staff and alumni. It was a year of intense momentum as the university moved forward to become a model for student success, a great research university, and an exemplar for strategic growth and innovative excellence. Join us as we look back at the top ten news stories of 2018, and experience our biggest accomplishments once again. These stories set a rapid pace of accomplishments going into 2019 and our 50th Anniversary celebration. Here's number two. (Dec. 30, 2018) -- UTSA today announced it has received a $15 million gift from San Antonio business leader Graham Weston to support the university’s proposed School of Data Science. The school is a major component in UTSA’s phased, 10-year approach to accelerating the development of its Downtown Campus as a destination for producing highly skilled professionals in big data and analytics, advancing economic development in the urban core and creating prosperity for San Antonio. At the same time, UTSA is actively engaged in highly collaborative discussions with the City of San Antonio and Bexar County for the transfer of downtown parcels of land, valued at $13 million, to the university. Those parcels would be the sites for the new school, a National Security Collaboration Center, and for the relocation of the UTSA College of Business. >> City approves land transfer for UTSA Downtown Campus initiative. >> Bexar County Commissioners sign off on land deal to support UTSA vision. Earlier this month, The University of Texas System Board of Regents approved a $70 million Permanent University Fund (PUF) allocation for the School of Data Science and National Security Collaboration Center. Combined with the Weston gift and an additional $5 million in university funds, UTSA has now secured the $90 million needed to fully advance those two construction projects. “The Board of Regents’ recent allocation of PUF funds to support physical space needed to propel UTSA’s advancement in data science and national security was a proud moment for us on many levels. While it helped to address UTSA’s construction needs, it also demonstrated the Regents’ confidence in the university’s leadership position in addressing critical workforce areas as well as its effectiveness in developing stronger public-private collaborations to make San Antonio and Texas as competitive as possible in the cyberspace arena,” said Sara Martinez Tucker, UT System regents’ chairman. Weston’s gift to UTSA, his largest personal gift ever, will help propel the university’s interdisciplinary approach to cybersecurity, big data, cloud computing, machine learning, and artificial intelligence – the engines that power the Internet. By locating the school in the heart of San Antonio’s high-tech corridor, UTSA will provide ready access to faculty experts, cutting edge research and well-trained students. Once approved by UT System Regents and the Texas Higher Education Coordinating Board, the School of Data Science will closely align its work with the National Security Collaboration Center, the state’s largest hub for government, university and industry partners in the cybersecurity field. The City of San Antonio properties identified for transfer to UTSA include 2.5 acres at the intersection of South Santa Rosa and Dolorosa Streets and one acre on Dolorosa near South Flores Street. They would be the sites for the National Security Collaboration Center and the School of Data Science. The mechanism for the property transfers will be negotiated following approvals from the city’s planning commission and San Antonio City Council. The properties are valued at $7.3 million. UTSA and the city are also actively exploring the joint development and management of the former Continental Hotel on West Commerce Street as housing for faculty and other urban professionals. The project will involve the renovation of the existing hotel and construction of a new building on the hotel’s former parking lot. UTSA is concurrently in discussions with Bexar County for the potential transfer of 2.6 acres of property, valued at $5.7 million and conjoining the city parcels on Dolorosa Street, for the construction of a new building to house the UTSA College of Business, which is currently located on the Main Campus. UTSA will seek $126 million in tuition revenue bonds (TRB) from the Texas Legislature next year for that construction. "Bexar County is a leader in the emerging cybersecurity and entrepreneurship sectors and we are excited and pleased to see that UTSA is going to build a National Security Collaboration Center and School of Data Science downtown on city-owned property. As we restore the section of San Pedro Creek on land abutting this project, we look forward to exploring the feasibility of locating UTSA’s College of Business on Bexar County property as funding becomes available from tuition revenue bonds or donor gifts,” said Bexar County Judge Nelson Wolff. A property transfer from Bexar County would be subject to approval by the Commissioners Court. Site planning and design for the proposed School of Data Science and National Cybersecurity Collaboration Center will begin immediately, with construction expected to start next fall. The project should be completed in time for the Fall 2021 academic year. Construction of the new College of Business will begin in 2020, contingent on financing from the tuition revenue bonds. Those three construction projects -- supported by the PUF funding, Weston gift, city and county land transfers, institutional funds and TRBs – total $229 million in value once all funding and property transfers are completed. 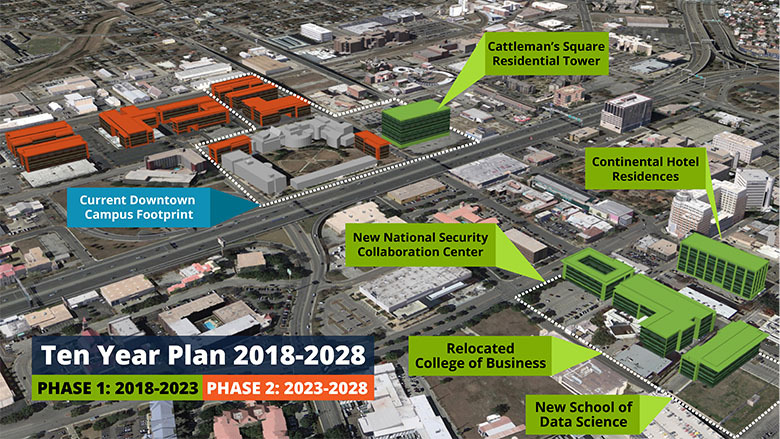 As another step in the initial phase of UTSA’s 10-year vision, the university will issue a request for qualifications (RFQ) this October for the development of its Cattleman’s Square property. Located within UTSA’s current Downtown Campus footprint, the project would be a public-private partnership developed as a mixed use residential tower. Additional development on, and west of, the current Downtown Campus is included in the second phase of the university’s 10-year plan. With the downtown initiatives underway, UTSA will have tremendous new potential at its Main Campus to further expand other academic and research programs including brain health, infectious diseases, regenerative medicine and medicinal chemistry, engineering, and liberal and fine arts. A new $95 million Science and Engineering Building is now under construction on the Main Campus and is slated to open in 2020. The 153,000 square foot facility will include classrooms, laboratories and collaborative space, and UTSA’s recently added chemical engineering program. By advancing its university-wide research capabilities, UTSA intends to earn designation as a National Research University Fund (NRUF) eligible institution with a Carnegie R1 (highest research activity) classification. Those achievements would garner UTSA millions of dollars in additional research funding, further benefiting the university and the San Antonio community. Watch the UTSA news conference making the announcement. Discover the UTSA Downtown Campus.